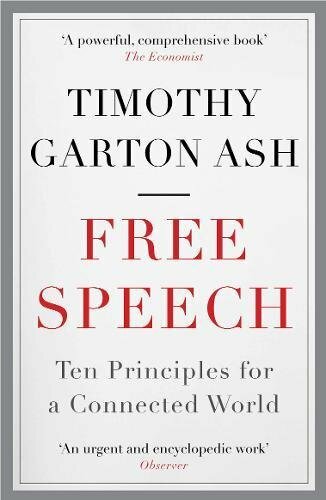 Timothy Garton Ash is Professor of European Studies at the University of Oxford and Isaiah Berlin Professorial Fellow at St Antony’s College, where he is also director of Free Speech Debate, a global research project of the Dahrendorf Programme for the Study of Freedom. You can click on a country to see what's going on there in terms of free speech here. What is the history of the present? 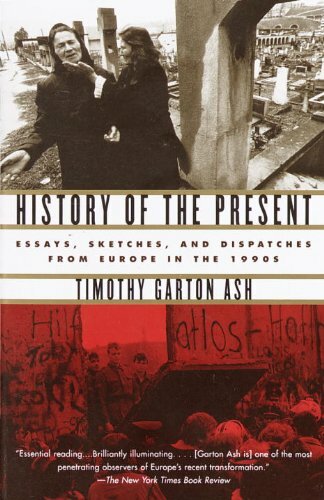 This is what I do and have been doing for the past 30-plus years – trying to write this strange mongrel genre of the history of the present, between journalism and scholarship, trying to understand very recent events in the way that a historian would, to understand contexts, causes and possible consequences. I’m obviously very interested in how people did it before. The interesting thing is that for much of history the history of your own time was considered to be the best history. It’s a fairly recent idea, only really since the 19th century, that people have thought you need this canonical 30 years before you started writing proper history. I was interviewing David Cortright recently, and he said that if you want to stop terrorism you have to look at how, historically, terrorists stopped being terrorists, and that it’s always by incorporating them into the democratic process. Yes, absolutely. It’s like looking at how wars end. So, we’re starting with Herodotus. Tell me a bit about the histories themselves. What could someone expect to learn from reading them? I think they could expect to learn a lot about the ancient world, the Greeks and, to a lesser extent, the Persians, but they could also learn a fair amount about how history happens – the interplay of individuals, personalities and larger forces like economics, geography, technology and, of course, chance. 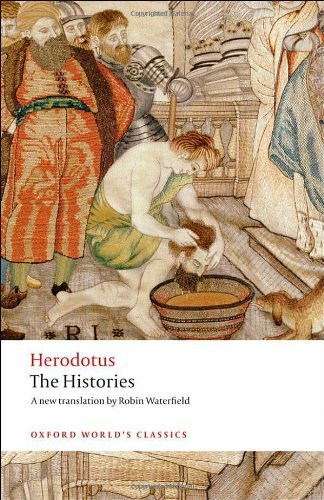 It’s all there in Herodotus, along, it has to be said, with a lot of fantastical details, like ants the size of dogs, flying snakes and stuff like that. It’s also a lot of fun and there’s vigour in the prose. Do you have favourite passages? Well, as I say, I think the passage where he is weighing up the Greek and Persian accounts for the origins of what the Greeks call the Persian Wars, that really is what we are still doing 2,500 years later. The essayist Macaulay is your next choice. Yes, the greatest historical essayist in the English language, in my view. This Everyman edition is two volumes of his essays from The Edinburgh Review, which, as you know, was The New York Review of Books of its time, or maybe I should turn that the other way round. It had long critical review essays of the kind people are still writing. Although Macaulay was a teeny bit dismissive of his own work in the genre they are actually models of their kind, full of wonderful insight. The essay on Frederick the Great in volume two will just have you rolling in the aisles. Why, why? What does he say? Well, you know that Frederick the Great as a young man had this dalliance with Voltaire, and Frederick the Great showed Voltaire his poems, at which Voltaire famously said: ‘See what a quantity of his dirty laundry the King has sent me to wash.’ Voltaire offered advice on the conduct of diplomacy of which Frederick the Great was equally contemptuous. The essays are just full of wonderful detail of that kind. A lot of them are actually biographical. 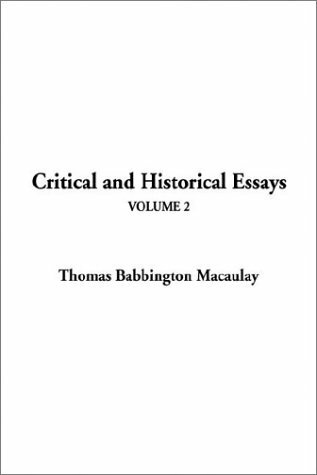 One of the other things I love about it is that quite a lot of my work is on the frontier between literature and politics, and Macaulay is absolutely there. He writes a wonderful essay on Milton. When you say literature and politics, are his subjects actually politicians or is he writing a kind of journalism? Well, Milton is Milton. He was deeply engaged in politics, but on the other hand you have Pitt, who was a writing and magnificently speaking politician; John Bunyan, a highly political writer – he’s got Machiavelli in there. It’s often what we might now call public intellectuals. But if you did a search you probably wouldn’t find Macaulay being mentioned more than once a month these days, but he’s an absolute master of the genre and I think many people are still in his debt without quite knowing it. Let’s move on to Orwell’s Homage to Catalonia. The finest model of how to write about a foreign conflict, a war or a revolution. 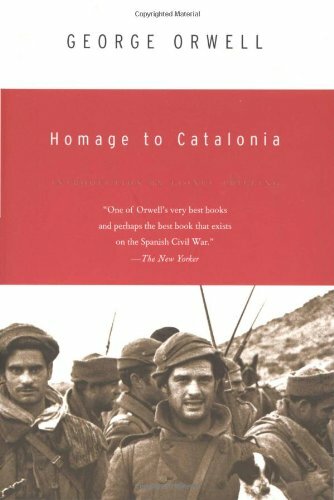 Anyone who wants to go off and write about Egypt, Tunisia or Libya today should pack a copy of Homage to Catalonia. It’s brilliant reportage. As you know, it opens with a vignette of an Italian militiaman in the barracks in Barcelona and he only saw this guy for a few moments but it captures the excitement. There’s great descriptive writing, hard political analysis and then, what is most fantastic, at the very end he says: ‘Beware of my partisanship, my mistakes of fact, and the distortion inevitably caused by my having seen only one corner of events.’ So he explicitly warns the reader about the selectivity and partisanship, which, in a way, makes it all the more credible. It’s the model of political reportage. 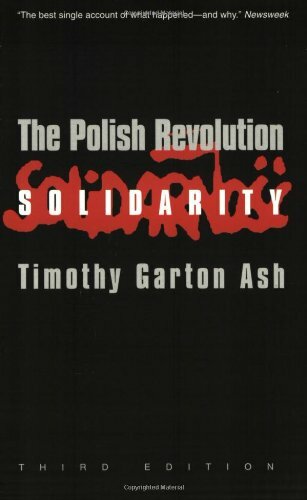 I went to Poland 30 years ago to write about Solidarity and that’s the book I read before I went. Yes, I think the thing that is so fascinating about television news is the extent of censorship that goes on all the time, from the cameraman who is actually standing there choosing what to shoot, to the person who writes the script, to the editor back in London or New York. By the time it gets to the screen it doesn’t have much bearing on what actually happened but because it’s presented in living pictures it is presented very much as true. As the only version of the truth. It’s very interesting. I’ll never forget going to Sarajevo during the Bosnian war and seeing on the news-stand the front page of a local news magazine which had pictures of hunks of charred flesh lying on the street, human remains from the bombing of the Sarajevo marketplace. I was nearly physically sick. Those pictures are being taken by photographers all the time and we never see them. It’s a good example of what we don’t get – and you can argue about whether we should or not. But there’s also the way in which things are shaped into at best a narrative and at worst a laundry line of clichés. Next: Trevor-Roper’s The Last Days of Hitler. 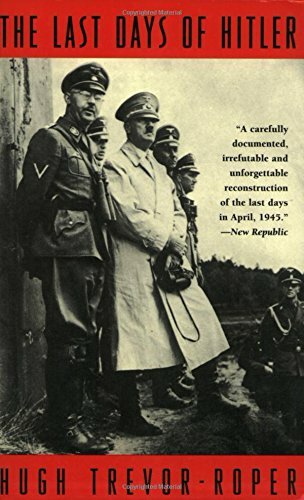 Despite the appalling debacle of the Hitler diaries, I think that Hugh Trevor-Roper’s Last Days of Hitler is the most superb work of contemporary history. It’s one stage on from Orwell’s Homage to Catalonia because Orwell is a reporter on the front line and Trevor-Roper is the historian who arrives the moment afterwards. He has a series of absolutely brilliant imaginative insights into what it was like to be in the court of Adolf Hitler. For example, the kind of institutional Darwinism between the different organisations and movements. 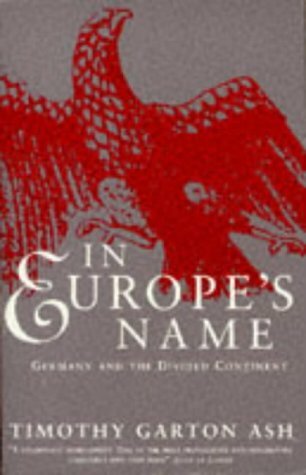 Armies of boring German scholars have spent decades in the archives producing 2,000-page tomes to show that Trevor-Roper was right in this insight he got in a few months. He also had the dream situation for a contemporary historian, which is to have all your key witnesses locked up in prison, available for interrogation at any moment. And did he talk to them all? Of course he did! 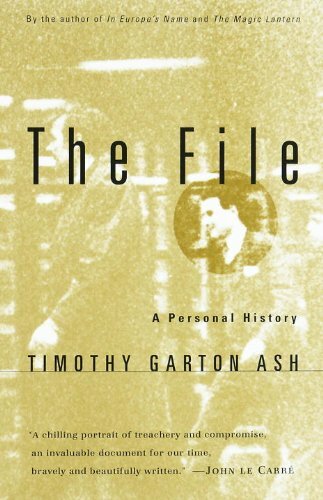 He was sent by the British military occupation authorities to do this study, which was to try to establish that Hitler had died, and how he’d died, because we didn’t have the corpse. Actually, the Russians had removed some of the charred remains. But he had all these Nazis who were locked up. We would all give our bottom dollar to have all our key witnesses locked up. Do we get an insight into their personalities? Do we get a feeling of what these people were like? Absolutely brilliantly. His valedictory lecture at Oxford, I think it was called ‘History and Imagination’, was about how important imagination is to the historian. When you’ve got the facts straight and read all the documents, then you have to imagine yourself, almost like a novelist, into that world, and that’s what he does. Can you give me an example of some little insight into a big Nazi? Did he like any of them? I think the figure who intrigued him and on whom he is very interesting was Albert Speer. Speer was much the most cultured and educated and apparently civilised person close to Hitler, and he was very close to Hitler. I think Hugh was fascinated by this question, which also fascinates me, of how the genuinely cultured, educated person comes to be a servant of great evil. Did he draw any conclusions? Well, I think that’s what I like about the book. It shows rather than tells. He doesn’t give you a sermon at the end; he just shows you how people were drawn in. I’m dying to read this now. You should. You’ll give yourself a treat. Your final choice is Evelyn Waugh’s Diaries. 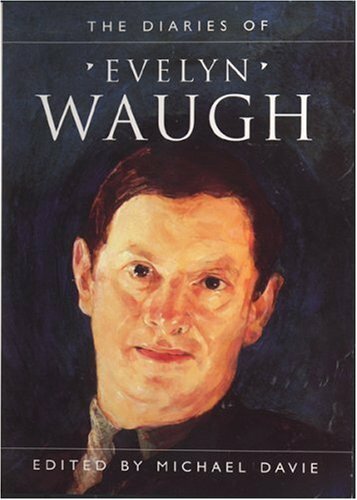 I think Evelyn Waugh is one of the great English novelists of the 20th century and he kept this diary intermittently. A lot of it is about the absolutely amazing quantities that he drank. He started quite early in the day. It’s a document of its time. It’s full of hugely politically incorrect and, by the end, almost self-parodic episodes but it’s also brilliant at catching the moment that life is turned into art. Let me give you an example. He goes off to witness the coronation of Haile Selassie, the event that was turned into Black Mischief, and he says: ‘Monday 3rd November, 1930. Met Polish attaché whose driver had brought him to wrong address. Lunched. Wrote description barbarous gebur. Went out to see what I could barbarous gebur. 3.30 no signs barbarity.’ That is so perfect, because it captures what an awful lot of journalists do. They go with their prejudiced expectations looking for the exotic, the oriental, the ghoulish: the barbarous gebur. They write a description of it and they go out to see if they can find traces of it – but there are no signs of barbarity. At that point you are at the fork in the road. The left path leads to veracity, the Orwellian path of historical truth where you actually have to say, ‘Well, it’s a great shame but it wasn’t so barbarous after all.’ Down the right fork is the path to the novel. I’m afraid that what happens in our own time, far too often, is that people mix the two. I used to work on a Sunday paper where they would write the headlines for Sunday’s paper on Tuesday and would tell you which story to go out and write. You’ve got it. There is a brilliant example recently exposed – a journalist wrote a series of gripping reports from Tunisia in an English paper, so they sent out a photographer to photograph the journalist on the spot. It turned out that the correspondent had never checked into the hotel or taken the flight and had written this fantastic copy from the South of France. It’s straight out of Scoop. What’s great about the Waugh diaries is that he’s so beautifully, satirically conscious of all that.